Several years ago, we had about 200 beetle-killed trees cut from our property. Beetle-killed trees are a fire hazard and we wanted to create a defensible space to the west and southwest of the cabin. (The wind almost always blows from that direction, and any wildfire would be highly likely to come from that way.) 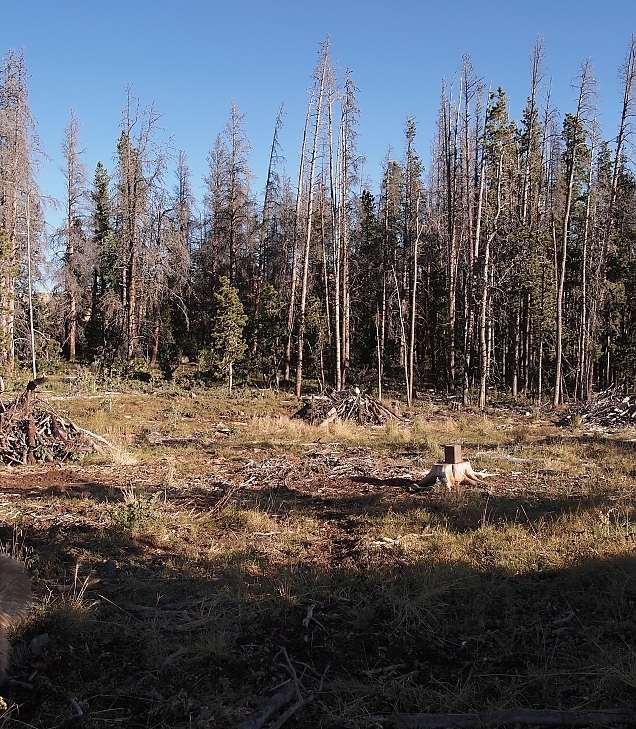 I'll likely talk more about the pine beetle infestation and the damage it has caused in Colorado forests in a future post. The logging company we hired to do the job did cut the trees and hauled them away. But, they left a huge mess behind. There were stumps and slash that they refused to clean up. Also, some dead trees that were not cut have subsequently fallen. In short, our "meadow" was pretty ugly. 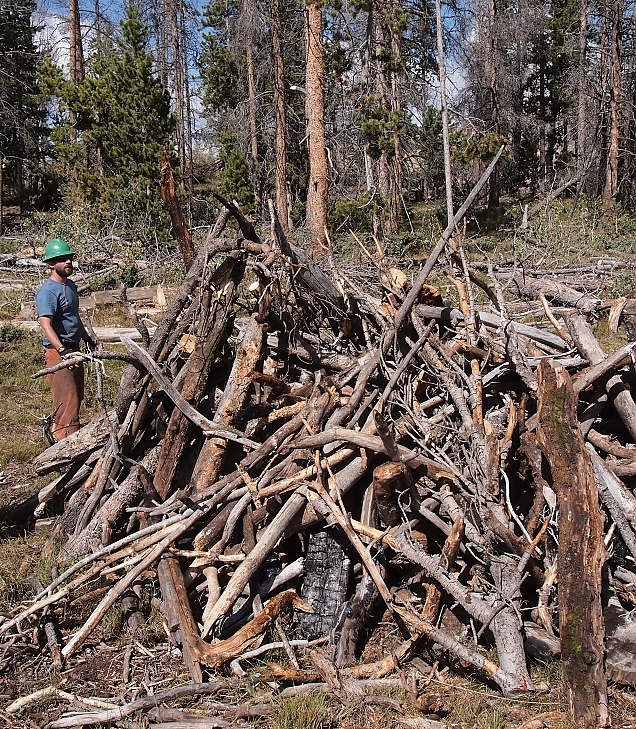 These piles are created so they can subsequently be burned. It is legal to burn these at our location subject to some rules. There must be at least 3" of snow on the ground and the wind must be 10 mph or less. And, I had to submit a request for a burn permit (easy to do online). Several agencies have to approve the request. Then, on the day of the burn the sheriff's office must be notified. Here is a wider view of the meadow after clean-up. You can see several of the slash piles, ready for ignition. Just need to wait for winter, snow, and no wind (along with access to the property). 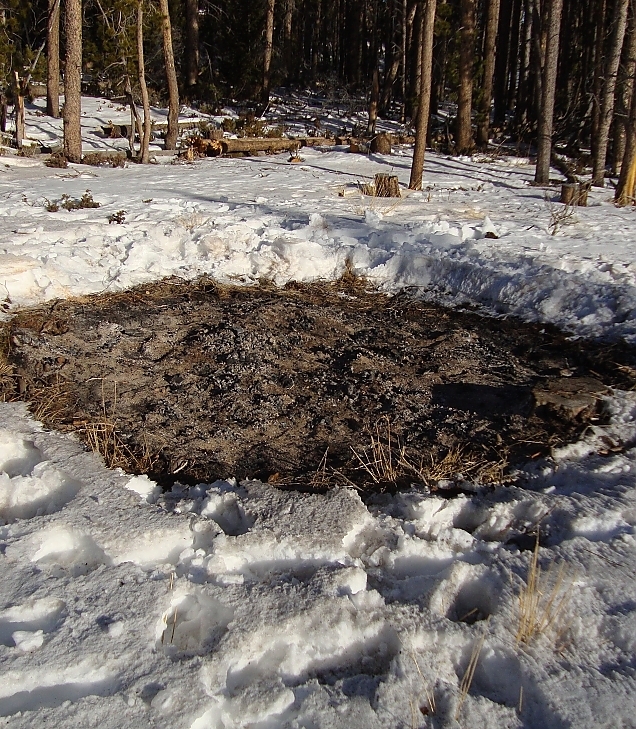 We waited several months before everything lined up to make burning possible, but this week the job got done! (Photo taken by a neighbor.) We'll rake this around and plant native grass and wildflower seeds!